I found the Christmas Puddings, a bundle of candy canes decorated with holly and ribbon, and a single candy cane, which I printed twice, reversing one of them. I used ProMarkers to color the candy canes, the holly, and the ribbons, then I fussy cut all of those with scissors. I printed the main bundle of candy canes one more time, colored it also, and then die cut it with a lacy doily Unbranded die. I used my paper cutter to cut the large square around all Christmas Puddings and layered that onto the white card front. I placed the die cut candy cane bundle onto the very middle of the puddings, adhered with ultra sticky tape. 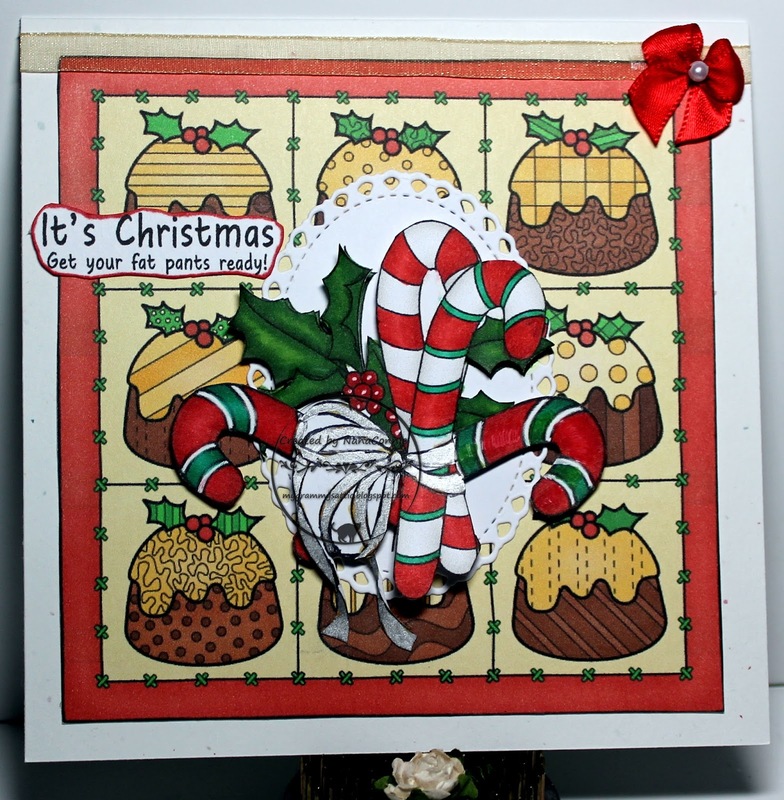 I took the single candy canes and added them to the fussy cut bundle canes. I used mini Pop Dots and added them on top of the die cut canes. That not only gave great dimension but also some wonderful texture. I found some lovely sheer gold ribbon, wrapped it around the top of the card front. then added one of my hand sewn bows which I 'dyed' red with a marker. I inked the edges of the sentiment and added it. Yes, indeed, definitely time for the "fat pants!" Great ending to a wonderful month of fun! Awesome card! Fabulous card, Connie! I have enjoyed your Beccy cards all month. Definitely need to apply to her next DT Call! I love the quilted feeling of your design and the good old fashioned candy canes fussy cut and grouped together. Beautiful card. You did an awesome job combining all these images NC, what a festive - and delicious - looking card! Your colouring is fabulous, particularly the candy canes, which all looks bright and shiny. Fabulous! I have been watching your cards on daily feed- so fun! You have been busy creating this month! How delightful! Love this fun and sweet card! Yummy!! I think I am going to be needing those "fat pants" real soon just looking at this yummy card!! Love it! Wonderful card and so colourful. Congrats on making it to the end of 30 days :-D Thank you for playing at IKEsWORLD Challenges. Great sentiment and love the layers! Great project! Thank you for playing with us at TTCRD ATG Challenge! Looking forward to seeing you again next time and good luck!